We at Oyaide Electric always strive for measuring up to customer's expectation. And we have tackled the development of new products by getting a clear grasp of user satisfaction. "ACROSS 900" was created by answering many customers' requests for release of balanced interconnects cable. Inheriting the basic concepts of ACROSS series such as C.I.S structure, halogen-free sheath and PCOCC-A conductor, ACROSS 900 was modified by upsizing its cable diameter for adding dynamism to its sound. In contrast to its elegant caviar black exterior color, ACROSS 900 is constructed by several innovative ideas and novel design concepts.Its basic architecture is C.I.S structure which was produced to diffuse vibrations into the air chamber rather than being re-absorbed into the cable structure. This newly-developed structure enhances not only vibration damping property but electrical characteristic. The Multi-stranded wire structure, originally developed for ACROSS series, is applied for maximum density and uniformity of wire structure and for infilling of internal space and preventing deformation among the wires. Moreover, spiral shielding is employed for infilling of internal space as well as the conductor and its halogen-free sheath was specifically developed for audio use. Since the product release of ACROSS 2000 in August 2006, ACROSS series have remained as long-selling products and are deeply admired in Japan and foreign countries. We have continuously been aiming to increase vibration damping property and noise protection capability. ACROSS 900 elevates interconnect cable to the new heights by applying C.I.S (Cross Insulated Stabilizer) structure developed specially for ACROSS series. Since the C.I.S structure supports the central conductor not with surface but point, it is able to minimize mutual interference between the central conductor and the outside. And internally built vibration damper diffuses vibrations into the air chamber rather than being re-absorbed into the cable structure and passed along with the signal as distortion. The incomparable advancement of vibration control properties and superior electrical characteristics realizes excellent performance without any loss of transmission. A core component of ACROSS 900 is PCOCC-A signal transmission unit, 0.78sq diameter, and forms Multi-stranded wire structure which was originally invented for ACROSS series and reflects our solid design concept. Rather than twisting whole wires, the four-layered inverted concentric structure is employed for maximum density and uniformity of wire structure and for infilling of internal space and preventing deformation among the wires. Spiral shielding is applied to infill internal space and to prevent deformation among the wires as well as the conductor. The number of wires used for the spiral shield is about three times more than the number for the conductor. Although ACROSS 900 gives an impression of a cable which is particularly effective in diffusing vibration because of its unique architecture, it also has high potentiality for transmission performance. Its electric capacitance is set to 68.0pF/m (1kHz) and characteristic impedance is set to 70Ω. Not only an innovative idea but also physical and numeric logic are necessary to realize excellent performance with no loss of transmission. The basis of dynamic and powerful performance is completed by C.I.S structure and PCOCC-A signal transmission unit. 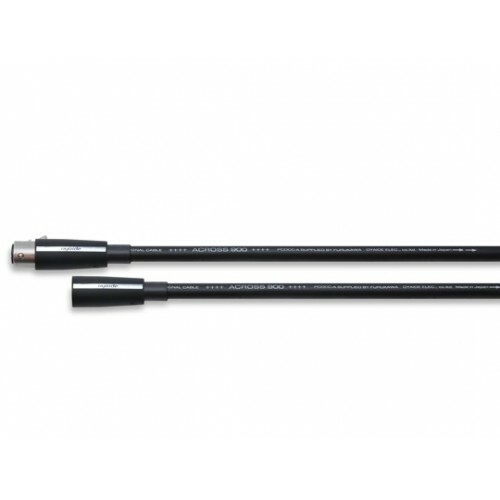 The last piece that is necessary for maximizing potential of ACROSS cable is the XLR connectors. We tested all XLR connector available on the market, and then the best XLR connector, silver plated XLR made by SWICHCRAFT, was selected.